The Arvada Center breaks out of the holiday pack. 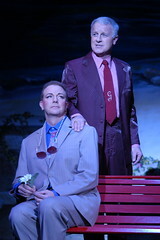 La Cage Aux Folles is a big, splashy musical with lots of big, splashy numbers. But unlike most such musicals, it’s also got heart, humor and a good story to tell. Beyond all that, in a time of intense mean-spiritedness and prejudice in the political arena, this show carries a message of tolerance and joy â€” and does so without preaching and while showing audiences a hell of a good time. This week on Running Lines, Denver Post theater critic John Moore talks with the actor playing Georges in the Arvada Center’s “La Cage aux Folles.” click here. Then click on the miniplayer’s triangular “play” button, and the podcast will begin playing without your having to download. The Arvada Center’s “La Cage aux Folles” is a garish, audacious and flamboyantly fun musical comedy, but its goal is so heartbreakingly humble: tolerance. The stakes here aren’t nearly as high as in its forebear, “Cabaret,” but their parallel pleas echo, from World War II Berlin, past the 1980s French Rivera, to Arvada today. This is a smart, heartfelt old musical that doesn’t feel old, because we still haven’t quite gotten the message. The boys in plaid are back, in an utterly contrived and too-long show that’s nonetheless beautifully performed, directed and choreographed.Â Read the whole review at Rocky Mtn New Website.